I don't recall the name of this dog, maybe my buddy Tim will reply to this email and let me know. It was taken in 2011 at Kississing Lake in northern Manitoba, where my father, sons, bro-in-laws and some friends used to go and fish each summer. I shot it with a Fuji W3, and approximated it into a phantogram using environmental cues. If you're not sure what I mean by "using environmental cues," I work in Photoshop on the right-eye image (could just as easily be done starting with the left), laying down guidelines guessing where a rectangle's corners would lie, essentially forming a trapezoid. From there I work on the left eye image, zooming in to around 200%, using in this case the patterns from the blades of grass to match up corners. I mark these too with guidelines, so that when I do the "perspective crop," the stereo window of the right-eye and left-eye images matches as exactly as possible. Combine the two, and voila, a phantogram emerges. 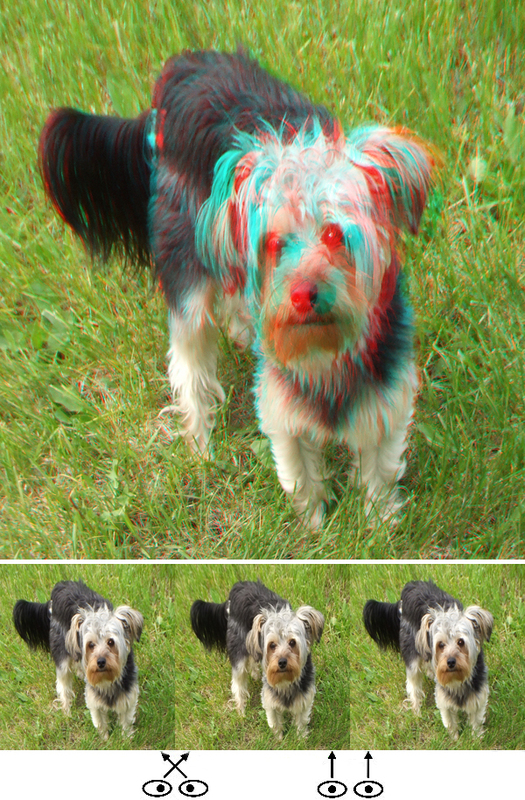 One thing worth noting is how well this image works in anaglyph, getting fairly vivid colors and practically no ghosting.